Dubbed by some historians as “the Teamsters of their time,” the French Canadian voyageurs made an incredible impact on the New World. Learn about these rugged men who paddled, portaged, traded and mapped our region. 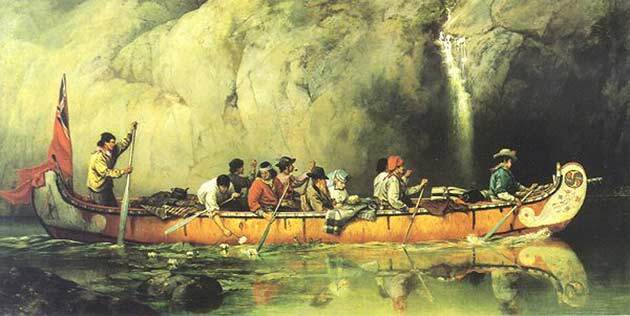 Oil painting “Canoe Manned by Voyageurs Passing a Waterfall,” by Frances Anne Hopkins, wife of Edward Hopkins, secretary to the Governor of the Hudson’s Bay Company. See the woman in the center of the canoe? Some believe the artist has depicted herself and her husband. The French were the first Europeans to explovre and colonize this region of the North American continent. Called New France, their colony lasted from Cartier’sv exploration of the St. Lawrence River in 1534 to the end of the French and Indian War in 1763. At its height, the territory stretched from Nova Scotia to the Rocky Mountains and from Hudson Bay to the Gulf of Mexico. During this time, there arose a group of French Canadians, mostly from near the St. Lawrence River, who became experts in paddling canoes; detecting rapids and falls in unfamiliar rivers; surviving in woodland wildernesses; and making friendly contact with the native populations. These were the voyageurs. Their skills and physical strength were invaluable to French explorers, who penetrated uncharted wilderness in search of a waterway to the Orient, souls to convert to Christianity, or furs to trade. When the Sieur Des Groseillier and his partner, Pierre-Esprit Radisson (who together established trading routes that led to the founding of the Hudson Bay Co.), conducted the first fur-trading expedition to Wisconsin in 1660, voyageurs paddled their canoes. And when Jesuit missionary Fr. 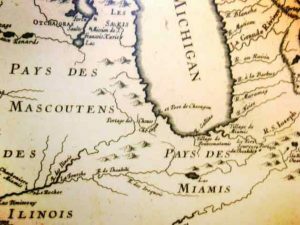 Jacques Marquette and explorer/mapmaker Louis Jolliet went in search of the Mississippi River in 1673, voyageurs conveyed their boats and belongings. From about 1650 to 1850, the economy of the Great Lakes and upper Mississippi region was dominated by the trading of furs, almost like our present economy revolves around oil. Marten, fox, lynx, bear, otter, wolf and muskrat hides were sought for foreign markets. Beaver pelts were especially valuable, since they could be made into felt hats and clothing for the fashionable of Europe. Originally, Indians hunted fur-bearing animals and took the pelts to Montreal or Quebec to trade them for axes, knives, blankets, pots and other manufactured goods. But as more explorers pushed westward into the wilderness of the Great Lakes, Canada and the Illinois country, traders found it more profitable to meet the Indians further inland, and then bring the pelts to Montreal themselves. In 1681, in order to control the price of furs and prevent a glut on the market, the French government attempted to regulate the number of fur traders, by requiring them to obtain a license to enter Indian country. Those traders who held such official sanctions, or worked for someone who did, were called voyageurs (travelers), while those illicit traders who conducted their business outside the law were referred to as coureur des bois (runners of the woods). The French also built trading posts and forts along the trade routes, which extended down the Mississippi by way of the Wisconsin, Rock and Illinois rivers in our area, and up into the interior of Canada. Situated between the Great Lakes and the Mississippi River, Wisconsin and Illinois commanded a strategic location in this trade. Each spring, brigades of huge “Montreal” canoes, each 35 to 40 feet long, carrying 10 to 14 crew members and up to four tons of cargo, would depart from Montreal and traverse the Great Lakes. Upon their arrival at the fort at Michilimackinac (Mackinac), the brigades would split up: those canoes with cargo destined for lower Wisconsin and Illinois went into Lake Michigan; those headed for Canada went over the portage at Sault Ste. Marie into Lake Superior. When they came to the rendezvous posts at places like Green Bay, Chicago, Grand Portage or La Pointe, the voyageurs would unload their trade goods and load up furs from the interior for the return trip. Other voyageurs would transfer goods to smaller “North” canoes, about 25 feet long, with crews up to eight, then travel inland waterways, portage between rivers, and bring their goods to trading posts in the interior. Those men who stayed in the back country over the winter were called hivernants (winterers). Voyageurs could paddle 14 to 18 hours a day, at 40 to 50 strokes per minute, averaging 4 to 6 miles per hour in still water. To pass the time and help keep their paddling rhythm, they sang songs, often with romantic or bawdy lyrics, as they sped across the water. The canoes carrying these enormous loads were built using methods learned from the Indians. A white cedar framework was covered with birch bark, sewn together using wattape, a stringy root from a conifer. Seams were sealed with melted gum from pine trees. 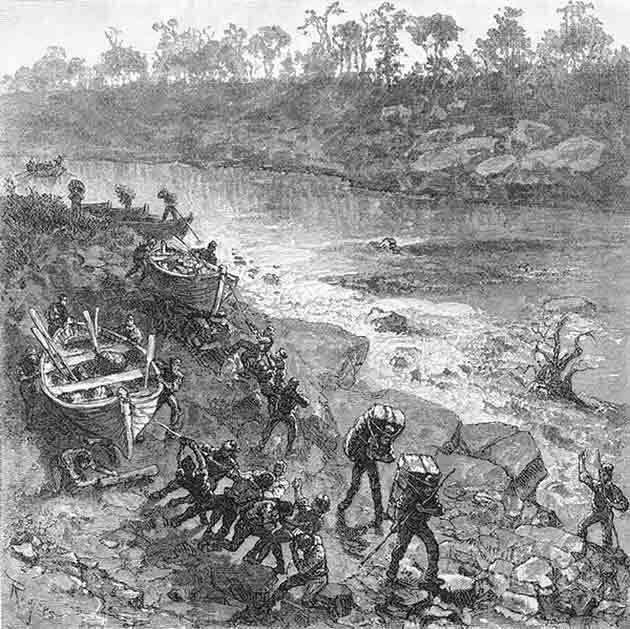 All materials were native to the northern forests, so needed repairs en route could be made from local materials. During this time, the French and British increasingly competed for land and resources, especially furs. This conflict culminated in the French and Indian War (the North American phase of Europe’s Seven Years War), which lasted in North America from 1754 to 1760. France’s defeat caused it to cede Canada and all territories east of the Mississippi to Great Britain. Twelve years later, the American Revolution began in British colonies to the east, and the voyageurs again found themselves caught up in a conflict not of their making. Their loyalties shifted with the fortunes of war. During the War of 1812, Americans again fought against the British, and voyageurs joined forces on both sides of the conflict. A corps of Canadian voyageurs was formed by the British and participated in battles at Michilimackinac and Prairie du Chien, where the Americans had built a fort. Although their knowledge of the country was excellent, the voyageurs were hardly model soldiers. One British officer noted that they came to parade with their pipes in their mouths and their rations of pork and bread stuck on their bayonets. When commanded to salute, the voyageurs took off their hats and bowed to the officers, instead. This was also the period during which trading companies rose to prominence, as the three nations struggled for control of the fur trade. The British Hudson’s Bay Co. “slept by the Bay” beginning in 1670 until forced by French expansion to erect forts in western Canada to protect its interests. The North West Company formed a loose organization of mostly French traders in 1789, and John Jacob Astor’s American Fur Company lasted from 1806 until 1842. All of this activity required the hiring of thousands of French-Canadian voyageurs to man the canoes and navigate the lakes and rivers to and from the various posts and forts. By the 1830s, overhunting had depleted many fur-bearing animals – especially beaver – in the Great Lakes/upper Mississippi region; the fur trade shifted farther west and north. Although the era of the voyageurs as travelers had ended, their impact as settlers continued to influence the economy and culture of this area. Many had lived at trading posts for part of the year, and some eventually took up land nearby to have a place to live when not paddling. As settlements grew, the voyageurs’ homesteads became part of the towns. Two of the most important portages where voyageurs and others traversed the land between Midwestern waterways – at Portage, Wis. and Chicago, Ill. – are part of a connected high ground called the mid-continent divide. This ridge was left by the receding glaciers in the last ice age, about 10,000 to 20,000 years ago, which formed the Great Lakes. According to David Dolak, senior lecturer at Chicago’s Columbia College, the divide encircles the Great Lakes from northeast Minnesota through the eastern quarter of Wisconsin, follows the shoreline of Lake Michigan through Illinois and Indiana, and finally curves eastward along the southern margins of Lakes Erie and Ontario. West and south of this divide, the waters flow into the Mississippi drainage system to the Gulf of Mexico. North and east, waters drain into the Great Lakes, the St. Lawrence River and the North Atlantic. “The feature in the Chicago area is called the Valparaiso moraine,” says Dolak. “It lies 15-20 miles inland from Lake Michigan, and is almost 200 feet higher than the present shoreline. By 12,000 years ago, the early incarnation of Lake Michigan had flooded inland all the way to the moraine, and eventually carved a channel through where the present day Des Plaines River turns southwest. “Historically, a broad swampy wetland, called Mud Lake, connected the south branch of the Chicago River with the Des Plaines River at that cut in the moraine. At that time, the Chicago River flowed into Lake Michigan. During rainy times, travelers could pull their canoes through this area from one river to the other, making it one of the easiest portages connecting the Atlantic to the Mississippi. Located on an island in the Des Plaines River, this museum is devoted to explaining the fur trade between the Potawatomie Indians and the French-Canadian voyageurs during the 18th century. The name of the island translates into “island of the hiding place,” and is named after an event in the late 1600s, when an unknown French trader buried his goods there after learning of dangers downstream. Displays include exhibits of beads, tools and beaver pelts; a replica of a voyageur encampment; a wigwam; and a beaver lodge. An annual Island Rendezvous in the fall features re-enactors portraying trappers, traders and voyageurs; canoe races; and musket shoots. 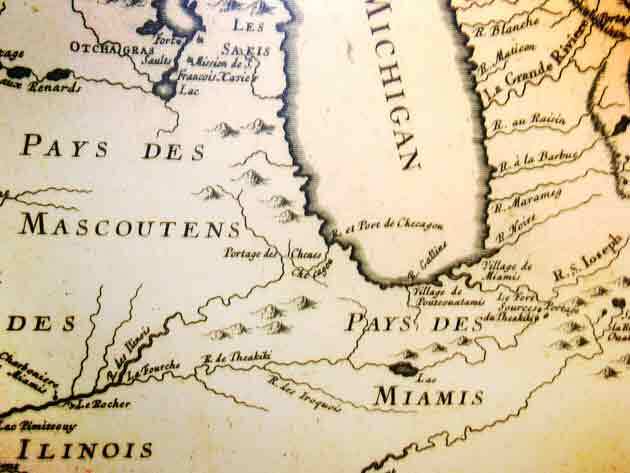 The site is located at the western end of the historic portage which connected the South Branch of the Chicago River with the Des Plaines River, first discovered by French explorers Fr. Jacques Marquette and Louis Jolliet. A memorial statue depicting Marquette and Jolliet with an Indian guide stands in the middle of the park, which also provides access to the I & M Canal Historic Trail. Exhibits tell the story of the fort, which stood guard over the area from 1816 to 1856, and was contested by the British, French and Americans. A “Cannons at the Fort” event in September depicts domestic and military life in the early 19th century. This restored late 19th-century mansion was the home of the Dousman family, and was constructed on the original site of Fort Crawford. Hercules Dousman became one of Wisconsin’s wealthiest men during the fur trade era. The exhibits include a replica of a fur trading post and a map of fur trade routes throughout the Great Lakes region. This entry was posted on Thursday, April 7th, 2011 at 11:59 am	and is filed under Features, Top Posts. You can follow any responses to this entry through the RSS 2.0 feed. Both comments and pings are currently closed.